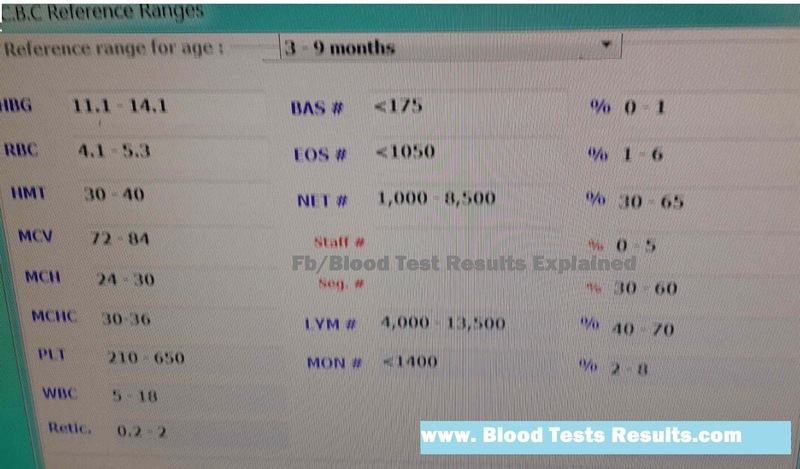 Normal levels chart of Complete blood count test for babies under 10 months after birthday. Hemoglobin levels declined about 10 grams per deciliter of blood to reach values near adult values, the reason behind that is the end of RBCs over destruction episode which starts after few days of births and lasts for weeks. Reticulocytes are cells precedes mature red blood cells in development chart, also reported as Retics count, retics normal count in a baby CBC start to appear in 1 week baby’s CBC and continue from that point until adulthood. Total and differential leukocytic count resembles counts of adults too. Note that Absolute count of differential white blood cells count is more preferred in diagnosis. Pediatric specialists frequently ask mothers for CBC test at such age unless they notice another disorder. Send your CBC test results to get answers from a specialists.